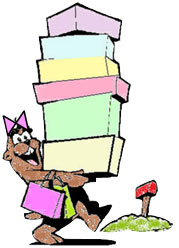 GoFa girls is your one stop shop for errand services of any kind. We offer affordable shopping and errand solutions to fit even the tightest budget. Our services include personal errands such as dry cleaning pick-up and delivery, movie rentals, grocery shopping, bank runs, utility bill payments, and so much more! We also provide a personal US shopping service where we make weekly trips to the US to purchase your favorite items, bring them home and deliver them to your door. All for a small service charge. For a complete list of all of our service please visit our website where a live customer service rep is waiting to assist you.